On August 20th 1912, 19.05 cm (7 1/2 inches) of rain fell, over 16.5 cm (6 1/2 inches) in only twelve hours, following a fortnight of rain. This caused a huge flood which washed away many locks, bridges and washed away a railway embankment. Water reached the first floor windows of some of the buildings and residents were rescued by boat. Eastern Daily Press, August 1912. Because all the locks were washed away, the wherries could not sail to Yarmouth anymore. It was too expensive to repair the locks. 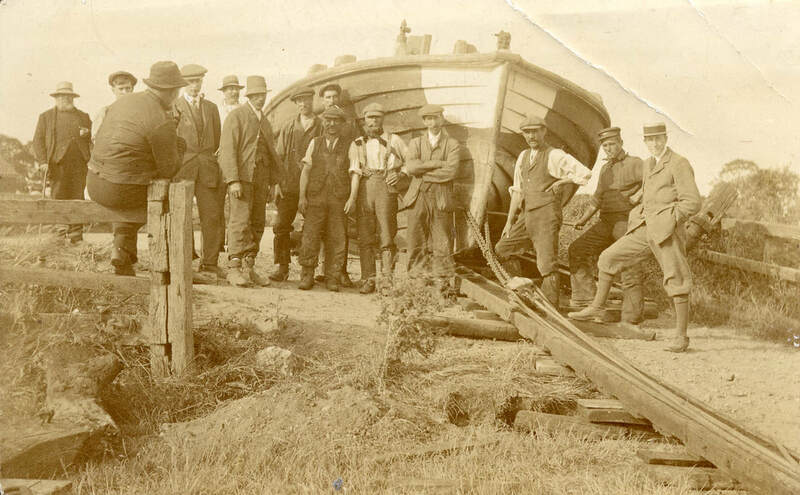 Some of the wherries were stuck after the flood and had to be lifted back into the water. The pictures show some of the workmen who helped to move it. This is where you can put all of your knowledge to the test. Click a answer and if you get them right you get a tick if you get it wrong sorry you will get a cross. All of the answers relate to the text above and on the page about Wherries. How much rain was there in 12 hours? How many infants were there on the school trip? What day was the annual school treat held?